Although many of the most serious occupational health hazards in the UK are now well controlled, it is important to check that numbers of work-related deaths continue to decline as expected and that no new fatal hazards are emerging. Since the early 1990s we have conducted periodic analyses of occupational mortality on behalf of the Health and Safety Executive (HSE) and Office for National Statistics. We found that overall mortality attributable to work declined substantially during 1979-2000, but noteworthy exceptions were observed. The absence of an expected decline in mortality from asbestosis led us to explore trends in greater detail. Mortality from asbestosis was maximal among men born during 1924-38, whereas for mesothelioma, mortality peaked in men born 1939-43. The pattern suggested that deaths from asbestosis were driven by high intensity exposure to asbestos before the age of 45, while rates of mesothelioma were influenced also by low intensity exposures, the prevalence of which did not peak until somewhat later. Our analysis of occupational mortality also suggested a previously unrecognised hazard of infectious lobar pneumonia after recent occupational exposure to metal fume. A case-control study conducted by our group confirmed this and more recent analysis indicated that it was responsible for some 45 deaths in England and Wales during 1991-2000. 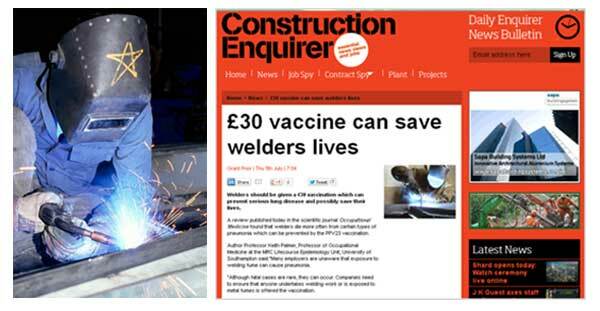 The Department of Health has recommended that employers offer welders vaccination against pneumococcus and we have helped to publicise both the advice and the supporting scientific evidence.